Do higher taxes lead to more growth? Nope, quite the opposite. High taxes mean more economic growth, according to progressives. Here’s why that’s nonsense. Recently, a follower of this blog sent me a meme obviously produced by a progressive-minded person who believes in higher taxes on corporations. 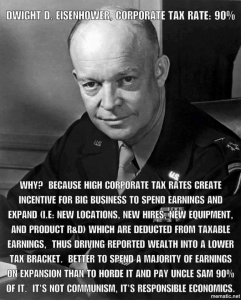 The meme asserts that statutory tax rates (what the government says you owe them) of close to 90 percent on corporations will promote employment growth, investment in new capital, new product development, and so on. Why? Because corporations will invest more money in these things so they can write them off or deduct them from their taxes, lowering their taxable earnings thus leading to a lower effective tax rate (what you actually pay the government in taxes after credits, deductions, etc are taken into account). 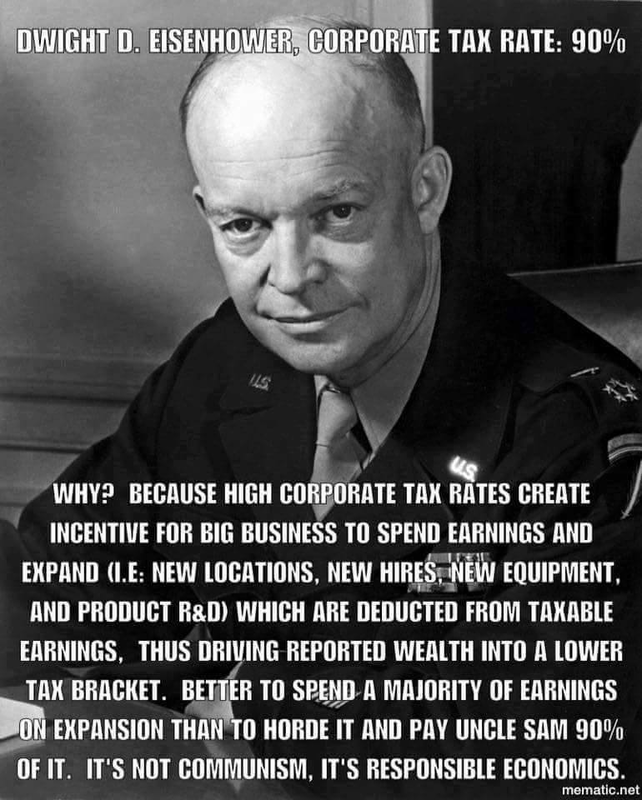 The meme implies that without high tax rates, corporations would simply “horde” the money and use it for nothing productive. High taxes rates aren’t communism, “it’s responsible economics,” the meme asserts. I have a few objections to this. For one, higher statutory tax rates likely go hand in hand with higher effective tax rates, regardless of businesses’ attempts to offset them utilizing deductions. If this is the case, than this will almost certainly reduce business investment, as higher effective tax rates naturally result in lower after-tax income, reducing the return on business investment, and consequently making investment less financially attractive. As we will see later in this article, higher effective tax rates do in fact lead to worse economic performance. Another thing worth noting is that companies are mobile. States and countries with higher statutory corporate taxes almost certainly deter companies from other states or countries from investing there. On a similar note, raising corporate tax rates may cause companies to move to regions with lower taxes. But this is all theoretical, and thankfully, a number of empirical papers have been published on exactly this matter to help us discern the truth. One working paper recently published by the Federal Reserve (Ljungqvist and Smolyansky 2015) exploited variation in statutory corporate taxes rates across US states over the period 1970 to 2010 in order to examine the question of whether or not corporate tax changes destroy or create jobs. Basically, they took economic outcomes in counties which experienced a corporate tax change (treatment group) and compared these outcomes to counties which bordered them but did not experience a corporate tax change (control group) because they belonged to a different state. Since counties bordering each other (but belonging to different states) typically have similar economic conditions yet experience different tax rate changes (since they belong to different states), the differential economic outcomes of these bordering counties following tax rate changes can plausibly be attributed to said tax rate changes. So what did the authors find using this approach? We find that increases in corporate tax rates lead to significant reductions in employment and income. We find little evidence that corporate tax cuts boost economic activity, unless implemented during recessions when they lead to significant increases in employment and income. Our spatial-discontinuity approach permits a causal interpretation of these findings by both establishing a plausible counterfactual and overcoming biases resulting from the fact that tax changes are often prompted by changes in economic conditions. State taxes have significant effect of the geographical location of star scientists and possibly other highly skilled workers. While there are many other factors that drive when innovative individual and innovative companies decide to locate, there are enough firms and workers on the margin that relative taxes matter. Thus, at the state level, it is abundantly clear that higher statutory corporate tax rates discourage innovation, economic growth, and employment. Unfortunately, I am not aware of any empirical research of the impact of federal (rather than state) statutory corporate tax changes on economic outcomes nationwide. There is however, research on federal effective corporate tax changes and how they relate to economic outcomes. On this topic, novel research by Karel Mertens of Cornell University is worth mentioning. Using an identification strategy which allowed him to identify the casual effects of effective income and corporate tax changes on economic performance, Mertens and co-author Morten O. Ravn found significant effects. In respect to corporate taxes, (Mertens and Ravn 2012) found that corporate tax increases had essentially no effect on nationwide employment, but they did reduce economic growth sharply. They also found that corporate tax increases/cuts were revenue neutral, meaning raising the corporate tax didn’t actually bring the government any revenue. This is likely a result of a laffer-curve effect where the revenue increasing effect of higher corporate taxes is essentially offset by the revenue reducing effects of lower economic growth. Similarly, a paper published in the American Journal of Macroeconomics constructed a dataset of comparable effective corporate tax rates across 85 countries. The authors found that higher corporate taxes rates had “large adverse effects”on measures of entrepreneurship, foreign investment, and aggregate investment across countries. Since the authors only established a correlation, these facts can be seen as providing evidence, but not proof, in line with the belief that corporate taxes are an economic hindrance.